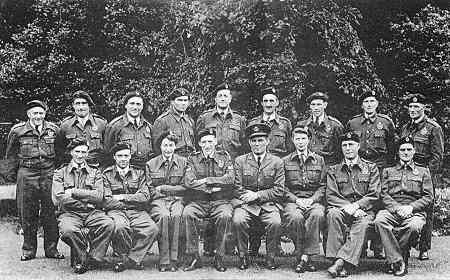 Along with his report on the bomber crash, Leslie Daft produced this photograph of the Wymeswold Royal Observer Corps which was connected with the RAF. This group was formed in 1925 and served until 1950. Their duties involved observation for any aircraft which they would report to the Air Force. Their 'post' was on the rising ground off the Melton Road about 80 yards beyond the Civic. This position had a wide view and the observers were able to see the anti-aircraft fire and light from the fires during the air raid on Coventry. This post was manned for 24 hours a day. Their 'log' should contain a report of the bomber crash but so far this document has not been traced at the Depository of Royal Observer Corps in Hampshire. Front row: C. Mills, W. K. Pike, R. Syme, W. Taylor, (?) from Coventry, Mrs Glass, W. Hames, P. Jalland.